Humidity Range: 5% Above Ambient From 55% To 95% RH+5%RH At Cool Temperatures. 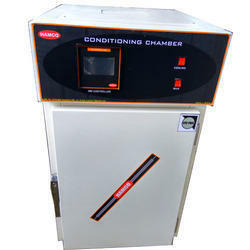 Air Circulation: "Two chamber blowers to have uniformity of Temperature under loaded condition. (Above 400Liters)"
Trays: Stainless Steel perforated trays. - besides outer double walled door, a full view inner glass door allows inspection of test samples without disturbing the inner chamber conditions. Inside made of Stainless Steel 304 quality outside Mild Steel duly powder coated. Fitted with cooling, heating and lighting arrangement. Temperature range. 10°C to 45°C + 1°C. Temperature can be obtained from 15°C to 45°C + 1°C., when all lights from two sides are 'ON'. 570 x 875 x 550 mms: 10 cu ft.
775 x 900 x 775 mms: 20 cu ft. 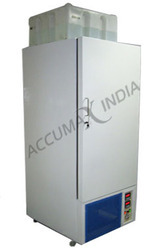 Being a quality-centric organization of this industry, we are engaged in offering a wide array of Plant Growth Chambers. We deals in Growth Chambers. 825 x 1200 x 825 mms: 30 cu ft.
900 x 1720 x 800 mms: 45 cu ft.
We are a unique name in the industry to provide our prestigious clients an exclusive range of Seed Germinator Chamber.